Range 45+ ® is a complete beauty program for mature skin: it diminishes wrinkles, fights against the loss of density and suppleness and limits skin slackening. Expert in nutricosmetics, Biocyte Laboratory introduces its first Global Beauty Program 45+ specifically designed for mature skin types. - these building blocks are bound together, thanks to hyaluronic acid. After the age of 45, a twofold phenomenon takes place. Not only does the production of these three essential building blocks slow down, but accumulated glucose adheres to collagen fibers, causing them to become rigid and preventing their renewal process: glycation. Expression lines are more and more pronounced. The skin becomes dry and dull, losing its supple and firm qualities. Slow down the aging process in 3 steps, with the Global Beauty Program 45+. 2 tablets per day, with a large glass of water. Use for 3 months. 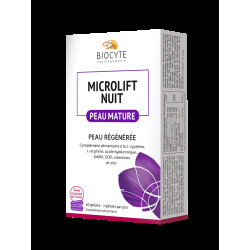 In addition to the Microlift 45+ treatment. 2 capsules per day, with a large glass of water. Use for 3 months. 2 capsules per day, with a large glass of water. Use for 3 months. ** ** International Unit "